It’s Election Time – Who Owns Your Political Party? Honeywell is #1 – I found this to be surprising. I don’t think of them as an enormous company, not like Microsoft or GE. They seem to be equal opportunity givers though, virtually split between parties. That’s called hedging your bets! American Association for Justice – What a name, huh? Sounds like a nice group since they’re all about justice. Well, they used to be called the Trial Lawyers’ Association, but since Trial Lawyers aren’t too popular given their knack for profiting from frivolous lawsuits and ambulance-chasing, they changed their name to something more appealing. They’re still trial lawyers. And they give 97% to Democrats. So, yes, that’s why tort reform was excluded from the Health care Bill that was passed by reconciliation completely along party lines. 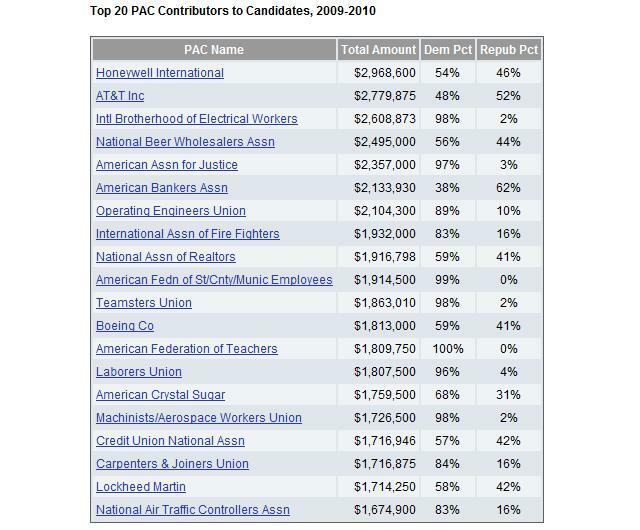 American Bankers Assn – Yes, those bailouts were certainly aimed at keeping these guys in business. While TARP is a dirty word in most households, surprisingly, it’s turned out to be the one bailout that didn’t really cost that much! Only $30 Billion or so as opposed to throwing money down the GM rathole, cash for clunkers and all the other stimulus efforts that simply pulled demand forward or redistributed wealth without any net benefit to the economy or country as a whole. These guys continue to benefit though, from a watered down Financial Reform Bill to the economic policies that tend to benefit large financials like the Treasury lending out free money while they lend it and trade it for a nice markup higher. 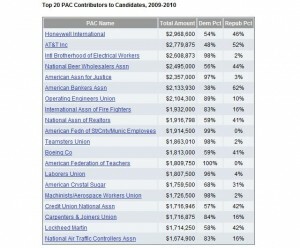 Unions, Lots of Unions – Out of the top 20 PACs in the US, I count 10 of them that are union organizations. And they all give primarily Democratic. This probably shouldn’t come as a surprise to you. But at least you know why Unions will keep spreading their tendrils into more and more facets of American life even as the manufacturing base shrinks. They’ll keep reaching into more public sector roles, tech, services, private retailers and anything else they can. So, expect your taxes to continue to rise and expect to pay more for goods and services as this trend continues. Who’s Missing? For all the demonization of Health Insurers, Pharmas, Tobacco, Oil Companies and the other outfits the media tends to broadcast as the anti-Christ, they are surprisingly absent from the list. I don’t hear much about unions on the nightly news or on MSNBC though. Dividend Recaps – Smart Policy, or Just More Politics? You miss that union wages used to push up wages even for non-union shops, as one way to avoid being unionized is to treat your workers as well as a union shop must. I think that was a good thing. But private unions have been shrinking for years, and rank #10 in a per-sector contribution breakdown, contributing $19 million. FIRE ranks #1 at $130 million. I wonder if that’s why they got bailed out to the tune of trillions of dollars, and none of them are in jail for fraud? But a bigger point is that far too much money is flowing into politics, to the point that the politicians are damn near owned by the lobbyists and campaign contributors, which pretty much kills democracy. 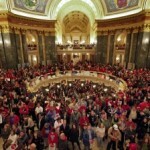 Public sector unions are sucking the blood out of all state, local and federal coffers. As a taxpayer, we shouldn’t be beholden to them. It’s a sham. They pool their funds to vote in democratic politicians who in turn continue to pass union-friendly legislation and negotiate sweetheart contracts. That’s democracy? Those are MY Tax Dollars! Sorry, I don’t think you should retire at 50 with a full pension for life (30 more years, the same amount of years worked?!) on the public teet. I was talking private sector unions, which are only 7% of the private workforce. But I take it you hate all unions, where as I don’t have a general opinion. Unions vary and their economic effects are complicated. But men fought and died for the right to unionize, and I don’t like to see businesses illegally preventing their formation. You clearly have an opinion, as do I. So, here’s the deal. If a private company allows their workforce to go union, they’re at a disadvantage to their competitors plain and simple. But you know what? I don’t have to own shares in that company. I can sell or pass as a retail investor. However, as a taxpayer I have no choice. I’m stuck in this absurd world of corruption, backscratching, vote-buying, making promises that can’t be kept with my tax dollars and then all the baggage that comes with it later when states and townships realize they can’t possibly keep the obligations some prior Democratic crony made. Public sector unions have completely destroyed the public education system in this country and they’re taking over budgets everywhere. There is no good reason these same services and roles can’t be non-union, contractors or privatized. Imagine – a little competition and higher performance in order to keep your job? The horror! There is plenty of corruption in this world, unions or no. But the world you describe and the world my unionized teacher friends and family describe are too different for me to reconcile, so, no surprise, I’ll stick with my friends and family. Their pensions were part of their contracts. They do not pay into Social Security. So if they are denied their pensions by their state, they are being denied their contracted retirement, and will be left with Federal SSI. You could move away from unions in the future, but it seems not at all fair to deny currently unionized public employees what they contracted for. Next post: Mortgage Rates Break New Records – How Low Can They Go?